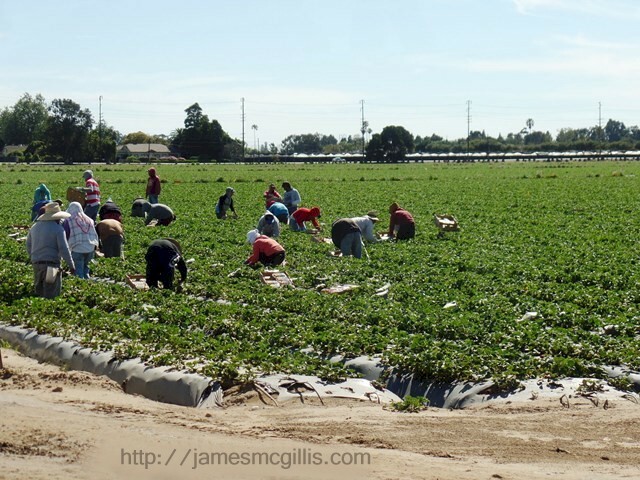 With its fertile land and mild coastal climate, the Oxnard Plain can support up to three row crops per year. After making a turn south of Camarillo, the Coast Line railroad heads due west for several miles, and then turns north at Oxnard. 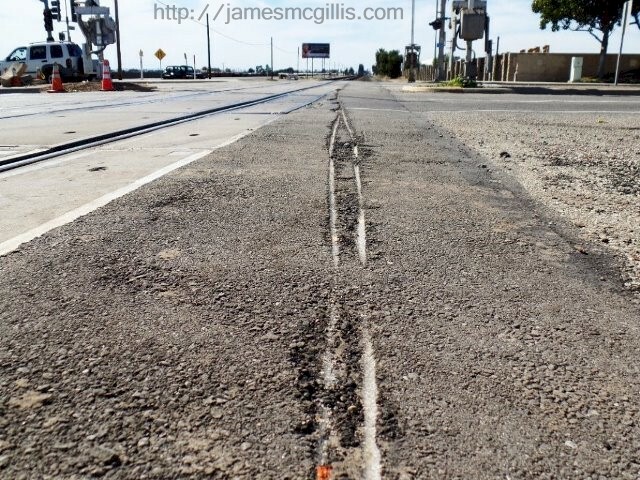 From Camarillo to Oxnard, State Route 34 (known as Fifth Street in Oxnard) parallels the train tracks. 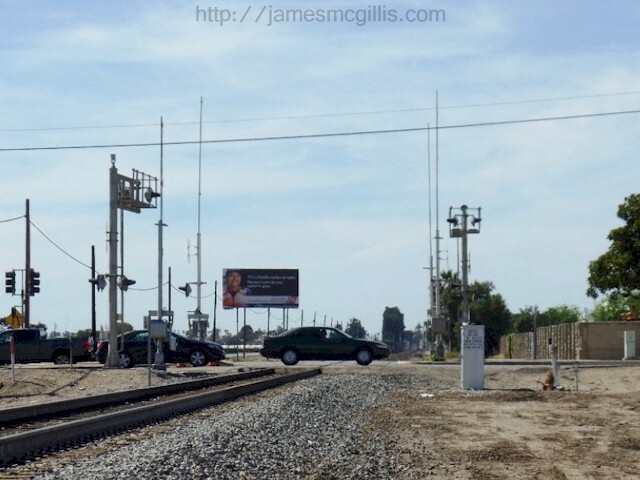 As it was during Kerouac’s 1955 excursion, northbound trains still encounter grade crossings at Pleasant Valley Road, South Las Posas Road and again at East Pleasant Valley Road. 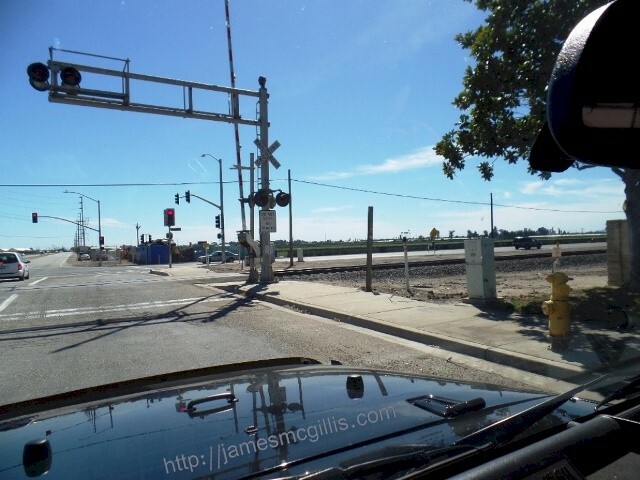 Before reaching Rice Ave., there is still one more grade crossing at North Del Norte Blvd. Just over 406 track-miles south from Kerouac’s surprisingly contemporary description of San Francisco, at Oxnard is the infamous intersection of South Rice Ave. and Fifth St. 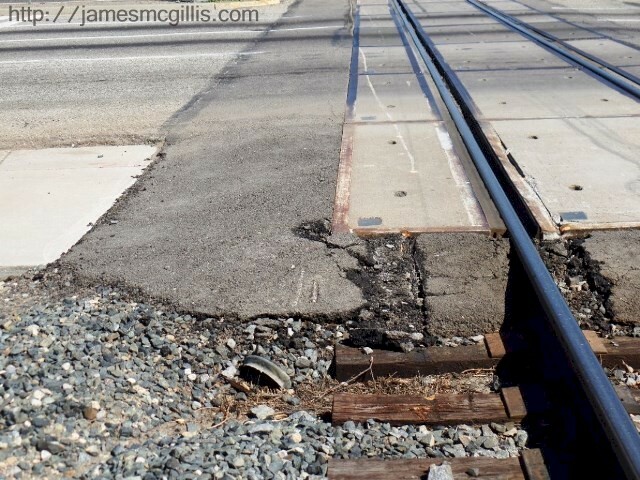 In frequency and severity of rail collisions, the grade crossing at Rice Ave. and Fifth St. is the most dangerous in Ventura County. 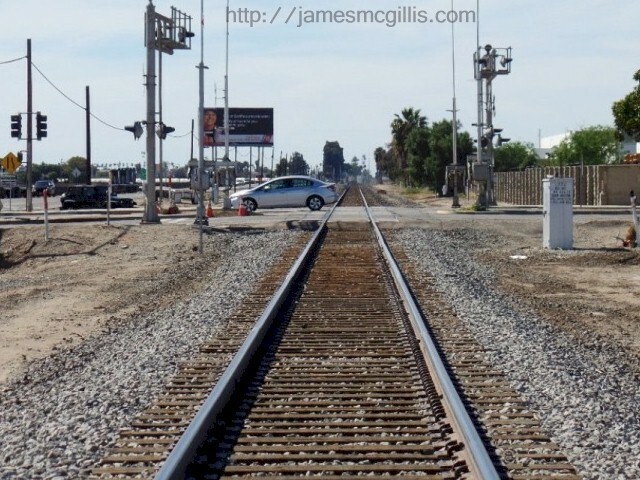 Although the location ranks as only the 23rd most hazardous rail crossing in California, the carnage involved with high-speed collisions at Rice Ave. makes it seem much worse. 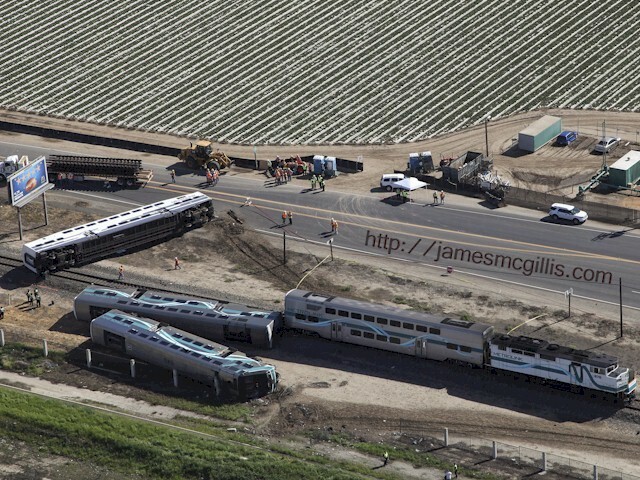 Since 2009, three separate train collisions have occurred at what is now the deadliest rail crossing in Ventura County. A small shrine near the grade crossing includes three white crosses, two of which commemorate a June 3, 2014 Amtrak/car collision that took two lives. The largest cross features a fading “RIP” for Joel Arias. Two baseball caps left at the makeshift memorial indicate that one or both decedents were San Francisco 49er fans. A long-dead miniature Christmas tree and wreath commemorated a poignant moment for friends and family of the young men. That fateful day, Arias accelerated his black, 2004 Infinity G35 southbound towards the Rice Ave. crossing. As his vehicle approached the tracks, red lights flashed, bells sounded and the crossing arms were down. Speeding onto the tracks, Arias’ Infinity collided with the engine of the eastbound Amtrak Coast Starlight passenger train. Although no one on the Amtrak train was injured, both twenty-year-old Arias and his nineteen-year-old passenger, Chris Stevens perished upon impact with the Amtrak locomotive. Nine months later, before sunrise on February 24, 2015, Jose Sanchez-Ramirez, 54, a first-time visitor from Tucson Arizona, approached the same location. In the dark, driving on unfamiliar roads, Sanchez-Ramirez turned his vehicle too soon. Eighty feet west of Rice Ave., his Ford F-450 utility truck and double-axle trailer came to rest, straddling the southern rail. After realizing that he had high-centered his rig, Sanchez-Ramirez turned on the emergency flashers, opened the driver-side door and vacated the scene on foot. Originating from the East Ventura Metrolink Station at 5:25 AM that day, Metrolink Train No. 102 accelerated to seventy-nine miles per hour before approaching the Rice Avenue grade crossing at 5:44 AM. 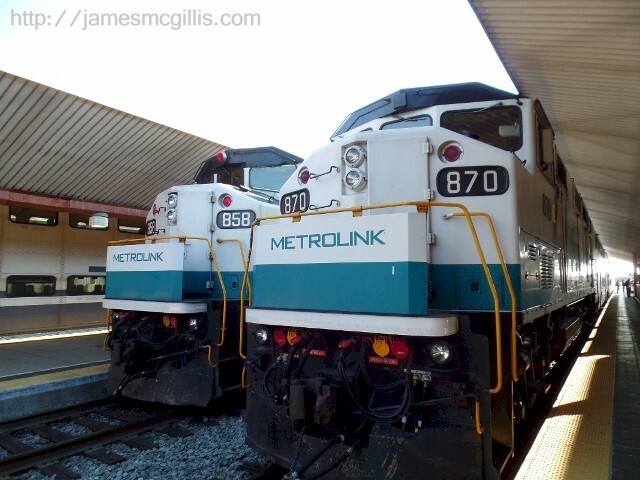 Southbound Metrolink trains typically feature a diesel pusher engine, several commuter coaches of various types and a cab-control car with enhanced crash protection at the front. In this case, the unoccupied pusher engine was the venerable Metrolink No. 870 and taking the lead was the newer Hyundai-Rotem cab-control car No. 645. 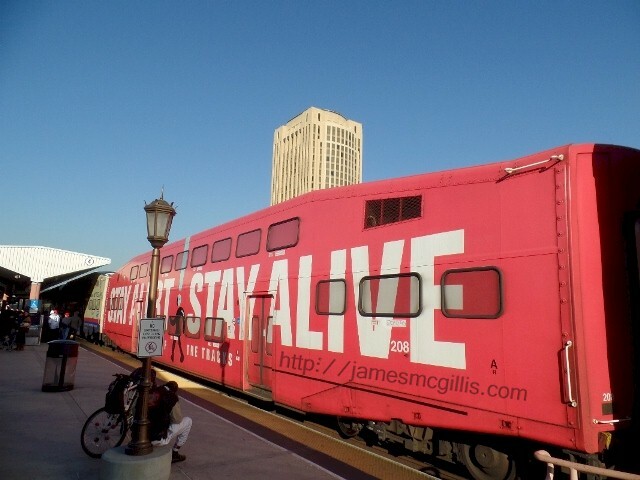 After a deadly collision in 2008 involving a Metrolink passenger train and a Union Pacific freight train in Chatsworth, California, Metrolink spent $263-million on a fleet of new, more crash-worthy passenger coaches. Although the cab-control car and the Hyundai-Rotem third and fourth coaches were of the new design, the second coach was an older, lighter and less crash-worthy Bombardier bi-level model. In retrospect, it seems foolish for Metrolink to create a five-car train in which the second coach is both unsafe and functionally obsolete. Soon after Sanchez-Ramirez abandoned his rig, Train No. 102 approached the Rice Ave. crossing at fifty-six miles per hour. Senior Metrolink Engineer Glenn Steele, 62, was in the right-hand seat of the cab. Steele, of Homeland in Riverside County, had forty-two years of experience and ranked No. 1 on the Metrolink seniority list. Operating the train from the left seat was an unnamed student engineer. This was to be his final check ride prior to the student becoming a Metrolink engineer. 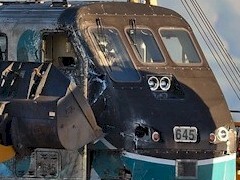 Survivors of a train collision often describe the events as happening in slow motion. Because of their immense size, railroad rolling stock takes time to derail, head off in different directions and then come to a rest. Still, in less than one minute the calamitous events of that February morning came to their inevitable conclusion. Moments before the collision, the truck’s headlights and emergency flashers loomed into view of cab-control car No. 645. From there, the student engineer applied the emergency brakes. It is unknown if the student engineer stayed in his seat throughout the inevitable collision with the truck and trailer. Later reports indicated that engineer Glenn Steele stayed in his seat throughout the flaming collision. 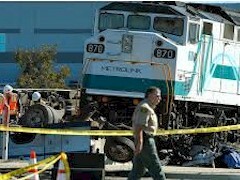 In those brief moments, he witnessed and felt the derailment, decoupling, spinning and toppling of the cab-control car. 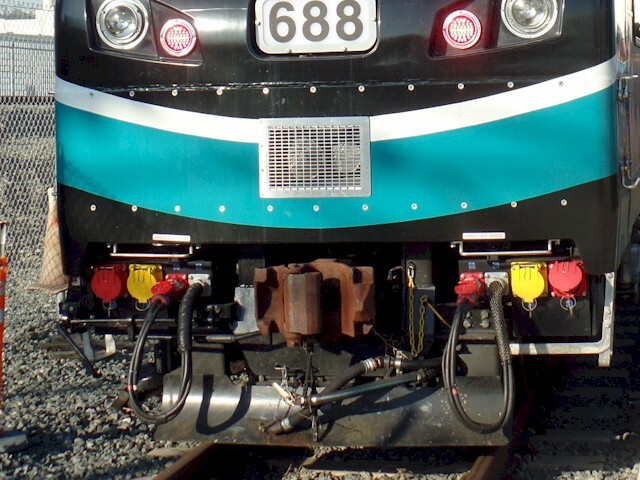 With the train's brakes in full emergency mode for only eight seconds, cab-control car No. 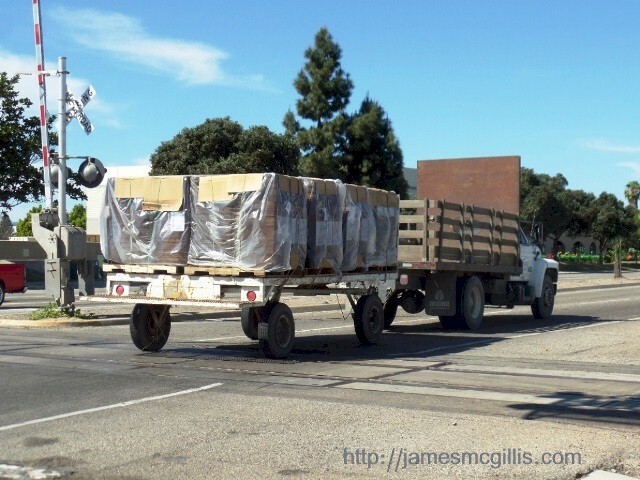 645 collided with the Ford F-450 eighty feet west of the Rice Ave. grade crossing. Lighter than its diesel pusher engine to the rear, the cab-control car derailed and then rode up over the wreckage of the F-450, slicing it almost in half. 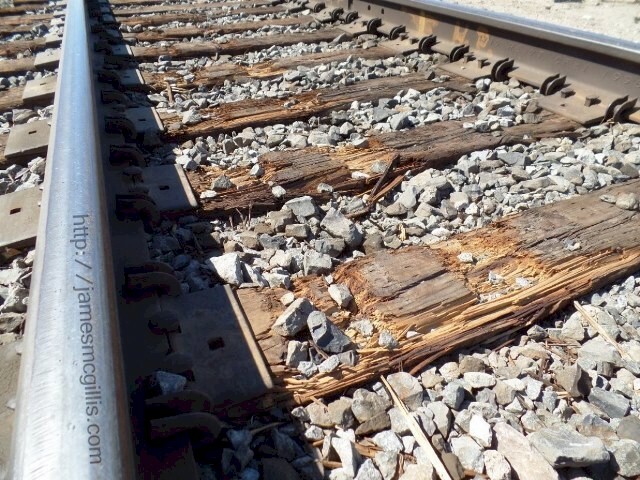 Forensic evidence shows that the derailed left wheel-truck of the cab-control car hit the steel edge of the grade crossing platform, hopped into the air for several feet and then veered diagonally to the left across Rice Ave.
As Sir Isaac Newton taught us, objects in motion tend to stay in motion. Metrolink Engine No. 870, an EMD F59PH rated at 3000 horsepower, took longer to stop than the four lighter coaches that preceded it across the roadway. Although cab-control car No. 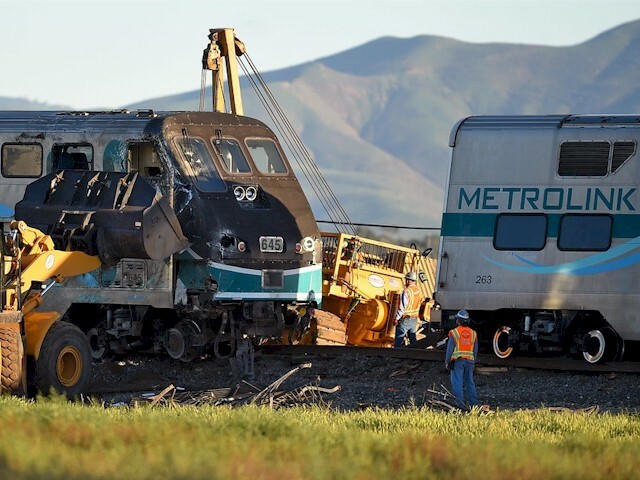 645 featured an anti-derailment device, which looks similar to a small snowplow, that lightweight blade was no match for the mass of a 14,000-pound utility truck and trailer. A photo taken after the collision shows that the anti-derailment “plow” had detached from the cab-control car and was lost in the collision. As cab-control car No. 645 veered to the left, the obsolete Bombardier bi-level coach No. 206 behind it pushed forward, exacerbating the derailment. Just east of the Rice Ave. grade crossing, the cab-control car and the second coach fully derailed and soon decoupled. As the cab-control car veered to the left, its steel wheels ripped up wooden railroad ties, further compromising the roadbed. Meanwhile, Engine No. 870 continued decelerating at the rear of the train. Like a highway patrol officer performing a “pit maneuver”, momentum from the second coach pivoted the cab-control car to the left. As it veered off-track and down an embankment, its crash-resistant nose dug into the bottom of a shallow depression. Because of its lightweight construction, the obsolete second coach had not withstood the extreme pressures exerted on the couplers at each end. Inertia from its previous mate pivoted the cab-control car 180-degrees, while toppling it onto its side. Coming to rest, cab-control car No. 645 lay on its right side, pointing opposite its original direction of travel. Meanwhile, the lightweight Bombardier second coach was off the rails at both ends and decoupled from both the cab-control car and the third coach. Having expended so much kinetic energy pushing the cab-control car asunder, the second coach launched off the rails to the right, where it came to rest, on its right side, many yards away. The newer and heavier third and fourth coaches derailed, yet stayed in alignment with the tracks. In the final moments of the collision, the third coach toppled onto its left side. Although partially derailed, Engine No. 870 came to rest in an upright position. As the nose of the cab-control car hit the dirt, Engineer Glenn Steele remained at the controls. As his lead car finished its tumultuous pirouette, the right side-window of the cab broke out and disappeared into the rubble. According to news reports, Steele suffered chest injuries in the crash. Later, a family member told the press that Steele’s heart had stopped twice in the days after the accident. One week after the collision, Glenn Steele succumbed to his injuries. This is Part 1 of a two-part article. To read Part 2, Click Here.